One condition for the continuation of negotiations on the EU-Russia partnership agreement could be Russia signing a non-aggression pact with its neighbours. This recommendation appears in a report drafted by Janusz Onyszkiewicz, a Polish Member of European Parliament, which was published on March 8. The strict tone of European MPs has created quite a negative reaction in the Kremlin. The head of the Russian Duma’s International Committee, Konstantin Kosachev, connected these recommendations with the coming elections in Europe. “Such a radical point of view from some European deputies is conditioned by the start of the election campaign. At the beginning of June the European Parliamentary elections are being conducted and many MP’s have a wish to be seen speculating about Russia,” Kosachev said. Russia has also been criticized by another European dignitary. 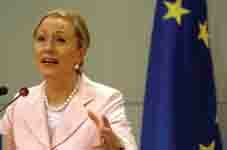 Benita Ferrero-Waldner, EU Commissioner for External Relations and the European Neighbourhood Policy, has stated that “The war in Georgia and the gas crisis have seriously undermined the level of trust” between Europe and Russia. However she also mentioned the importance of the continuation of cooperation with Moscow. “We now stand at a crossroads. Russia has been hit very hard by the global economic crisis and especially the fall in energy prices. When I visited Moscow at the beginning of February with [EC] President Barroso and eight other Commissioners I found a growing recognition of the level of our mutual dependence and necessity to work together on many issues,” said Ferrero-Waldner speaking on March 9 in London. “Last November the Commission led the EU’s review of EU/Russia relations. We concluded that we should not try to hide certain differences which exist between us, such as Georgia, and human rights; but equally not let these prevent us from hard-headed engagement on matters of mutual interest. We are currently negotiating a new EU/Russia Agreement aimed at providing legally binding commitments and an effective way of settling disputes. Together with Russia’s WTO accession, which we have always strongly supported, this is the most effective way of encouraging Russia in the direction of respecting rules-based systems, “Ferrero-Waldner added. The European Commissioner underlined that the new agreement with Russia may make it possible for the sides to draw “clear red lines” in their relations. Among these “red lines’ she mentioned “Russia’s commitments to withdraw its troops from Moldova and Georgia.” Ferrero-Waldner also spoke about the Eastern Partnership Programme involving the ex-Soviet republics of Armenia, Azerbaijan, Belarus, Georgia, Moldova and Ukraine. She called this project “ambitious” and stated that the deepening bilateral relations between the EU and its Eastern partners will depend on progress towards “democracy, rule of law and human rights” in the mentioned countries. “Those who make progress in these areas will qualify for a closer political relationship with the EU – in the form of an Association Agreement,” the Commissioner said. “Building relationships with the Eastern partners has to be a two way street. They want freer trade and easier travel. The EU wants to encourage reform. We can only make real progress on free trade agreements with economies that are genuinely ready to open up to competition. And we can only offer visa facilitation to countries which have secure travel documents, properly run borders and arrangements for the readmission of returnees,” stated the Commissioner. The statements of the European officials were “totally unexpected” for Russia, considers independent Georgian political analyst Soso Tsiskarishvili. He says that this step of drawing “red lines” over Russia’s actions in Georgia was agreed between Washington and Brussels and the Kremlin was not prepared for it, due to the seemingly tolerant tone of the West towards Russia in recent times. “This was an answer to the impudent proposal of Russian President Medvedev to create “a new strategic security concept” with the West. I think Europe was surprised by such an initiative from a country which has itself conducted aggression towards it neighbour. Russia ignored its weak position concerning the explanations of the war in Georgia for too long, and now it has got even more trouble than it would have got otherwise, because Brussels has mentioned Russian troops’ status in Moldova alongside Georgian issues,” considers the analyst.